Ever since Kyleen, the Texan New Yorker, pointed out that to me that if you Google "Peggy Hill's Apple Brown Betty" a link to a post on my blog from almost a year ago shows up as the number 1 link, I've been feeling a little guilty. The post that got me up there on Google was a post for Frito Chili Pie and only mentioned Peggy Hill and Apple Brown Betty. I feel like a bad girlfriend who's led all those people on without putting out. But today is the day we remedy that. By the way, that happened a couple of months ago. Since then I've dropped to number 3. Which is a little strange considering that ever since that post, I've been getting fairly regular traffic from people looking for Peggy's Apple Brown Betty, but recently I've gotten a half dozen or more google searches for that every single day! It makes me wonder if one of the episodes that features the Brown Betty has aired ln syndication lately. Happily on my part, for all of you "Peggy Hill's Apple Brown Betty" searchers on Google and Yahoo, here's your recipe. I'll be honest. I had never made or eaten it before. I looked at several recipes, all with variations on a theme but in general the dish seemed to be a cross between a crisp and and bread pudding. I chose a recipe from Epicurious because I wanted to get something representative but also something from a site I felt pretty comfortable trusting. I like all the recipe sites where anyone can upload recipes but a couple of times I've been disappointed in the past. Not this time. 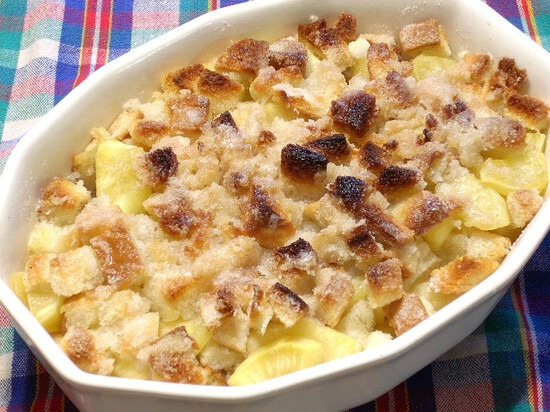 This Brown Betty turned out to be a simple, straight-forward, fresh-apple tasting dessert with a crunchy topping like crisp, but with a soft, comfort-carby mouth feel like a bread pudding. It wasn't nearly has heavy as I thought it would be which was a plus for these hot summer days. Do you ever stop and think about how much our food is influenced by pop culture? When I say Apple Brown Betty, everyone who watches King of the Hill immediately knows what I'm talking about. Does the beverage Romulan Ale conjure up a memory? How about Carmela's ricotta pie that bribed the reference letter for Meadow's college application or the baked ziti we drooled over for six seasons? In Las Vegas, several of the 7-Elevens have been temporarily changed into Kwik-E-marts for the summer, selling "good Squishee", Krusty the Clown cereal, and Homer's pink donuts. If you had the opportunity, would you go in? I would. Food is so much a part of our culture in every facet: celebrations, family time, snacks, and even driven by our pop culture or there would be no market for the Star Trek Cookbook and Entertaining with the Sopranos and Artie Bucco's Sopranos family Cookbook. I suppose one could look down from one's nose and call it a travesty. I call it fun. Fairly heavy on the cardamom and nutmeg, Peggy's Brown Betty is my contribution to Weekend Herb Blogging this week. Created by Kalyn of Kalyn's Kitchen, WHB is hosted this week by Susan of Food Blogga. Sunday evening, Susan will have a list of all the herby spicy dishes cooked this week.